Custom-designed from the ground up, this stunning villa reduced the owners' living space by half, while preserving their expansive lifestyle. The breakfast room bay was repositioned to allow for a spacious rear deck with lake views. A custom-designed wool rug by Davis & Davis unifies the great room’s sophisticated black-and-gray palette. Complementing the Century sectional is a Marge Carson table, and a pensive image by Richard Hall tops the arch to the breakfast room. Classically elegant, the formal dining room showcases a magnificent walnut/ebony/mahogany table, silk-upholstered E.J. 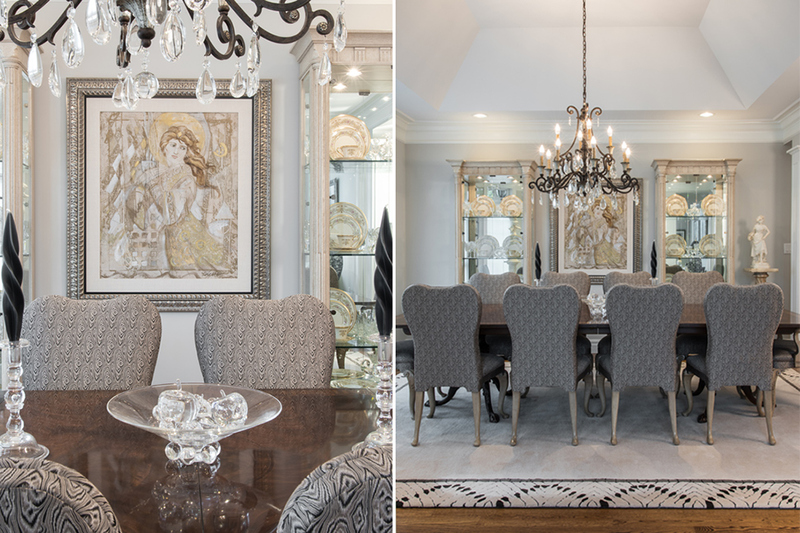 Victor dining chairs, and columned china cabinets in an antique white wash. An array of Steuben glass, antique statuary, and an ethereal Lorella painting are displayed in the dining room. Flanked by a classical statue, the custom glass entry door forecasts the villa’s aesthetic mix of styles. The piano room blends favorite furnishings from the owners’ previous home with new accent pieces. A fourth Richard Hall scratch painting was commissioned to complete the grouping above the sofa. 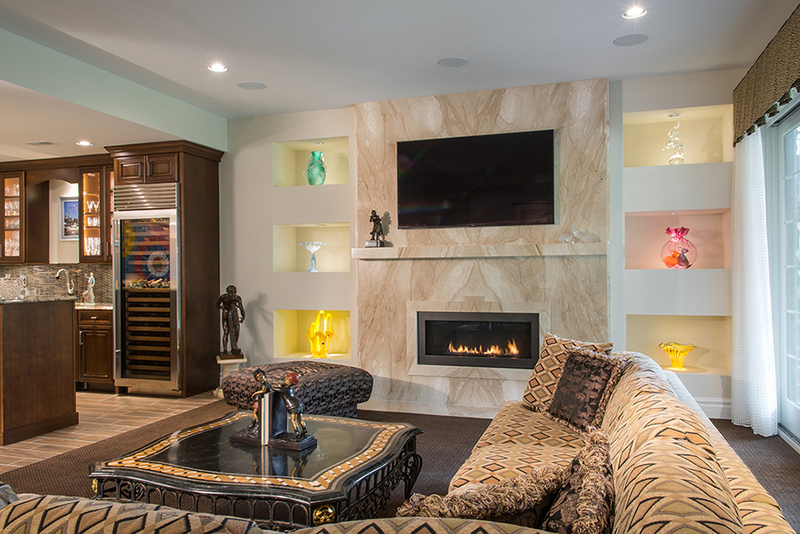 A dramatic fireplace with book-matched marble surround dominates the lower-level entertainment area. Gleaming granite surfaces, Pepper’s bold wall-tile design, and distressed walnut cabinetry, finely crafted by Beck/Allen, add glamour to the villa’s expansive island kitchen. 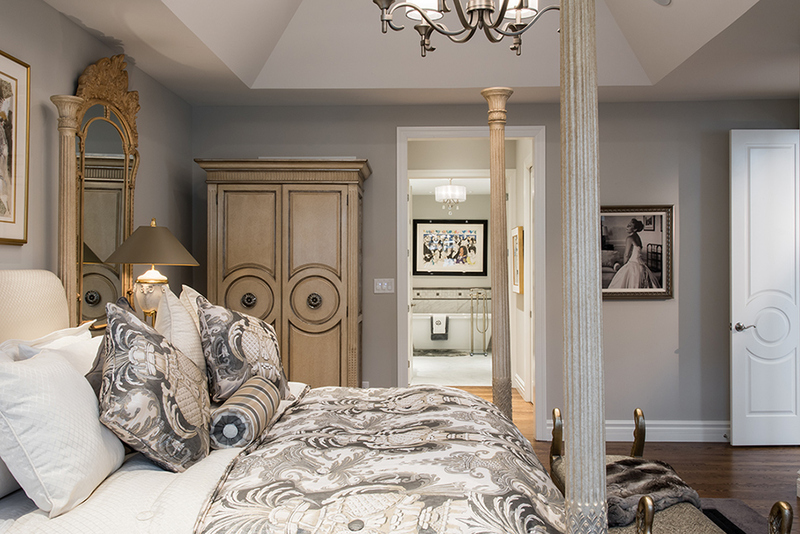 Adjoined by an opulent spa-like bath, the master retreat is a vision in gray and gold, with its handprint silk Brunschwig & Fils bedding, antiqued Marge Carson wardrobe, and ceramic Chapman table lamps. 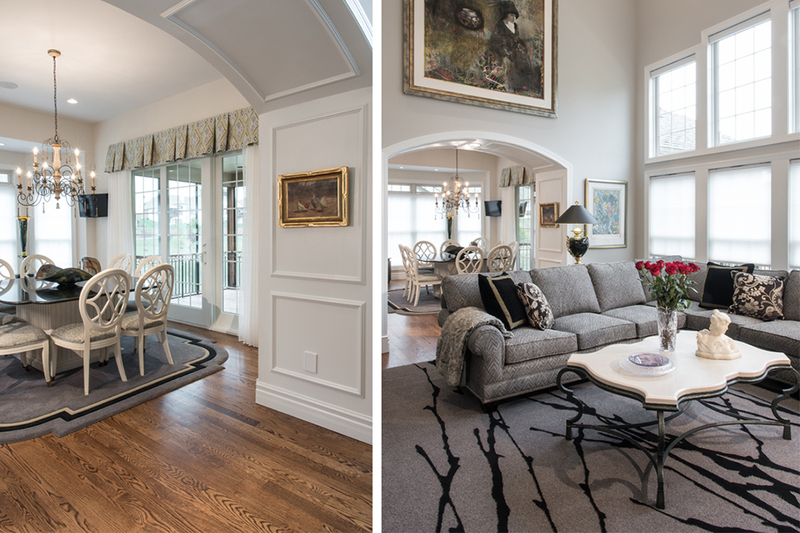 After 20 years in their spacious Frontenac home, the owners were ready to scale down, savor their achievements and enjoy a less-demanding lifestyle. Privacy, easy-maintenance living and “good neighbors” were at the top of the couple’s list as they searched for a new location. Ultimately, the country-club atmosphere of a luxury-villa community, under construction by custom builder Simon Homes in West County, met the couple’s qualifications.Decision made, “We hired Eddie first,” says the husband. The “Eddie” he refers to is Edwin Pepper of Edwin Pepper Interiors, one of the region’s best-known and most-respected design firms for more than 50 years. Pepper had worked with the couple on a half dozen of their previous homes, including the Frontenac residence, and had become a good friend. Indicative of their warm relationship, Pepper was on hand to conduct SLHL’s tour of the completed villa. Working closely with Simon Homes president Barry Simon, Pepper and the owners began the custom-design process, which took 14 months. Set on a lovely site with a lake view, the 5,500-square-foot, 1.5-story floor plan features a side entrance, generously proportioned living spaces, a two-story great room, main-floor master suite, finished walkout lower level and an oversized three-car garage. According to Pepper, the primary challenge was to consolidate the furnishings that had filled 11,000 square feet in the owners’ prior home into just half the space. Making the space comfortable and fully usable was equally important since the couple has a large family in the immediate area, including eight grandchildren and five great-grandchildren, with a sixth on the way at the time of the tour. Starting in the entry foyer, job-finished oak-select flooring blankets much of the home’s main level. Here, Pepper custom designed square pillars to define the open formal dining room and to showcase several sculptures, and the main hall was modified to accommodate a treasured buffet. Dominating the dining room is a magnificent walnut/ebony/mahogany table, surrounded by dining chairs and a limestone-topped oak buffet from E.J. Victor. An ethereal Lorella painting hangs between two classical, lighted china cabinets in an antique white wash, and decorative accents include considerable Steuben glass and antique statuary and pedestals from the World’s Fair. Across the foyer, the open piano room blends a new Yamaha baby grand with a previously owned, neutral-toned sofa, textured wool area rugs and complementary Marge Carson side chairs. Above the sofa are four monochromatic scratch paintings by Richard Hall, an English artist who works in a variety of media and whose talent is on display throughout the villa. “We already had three of these scratch pieces by Hall and commissioned the fourth for the piano room,” the husband notes. This comment prompted Pepper to mention that he and the owners had made several trips to Phoenix and to Israel acquiring artwork. In the two-story great room, an architectural window wall, fitted with automated shades, floods the space with natural light. Pepper worked with Forshaw to design the magnificent stone-and-marble fireplace, and a unique Davis & Davis wool rug was custom designed to complement the predominately black-and-gray furnishings. Highlights include a warm-gray Century sectional, wrought-iron and limestone Marge Carson accent tables, a Hancock & Moore power recliner, a swivel chair upholstered in a pointillist fabric and a wrought-iron and textured glass chandelier. 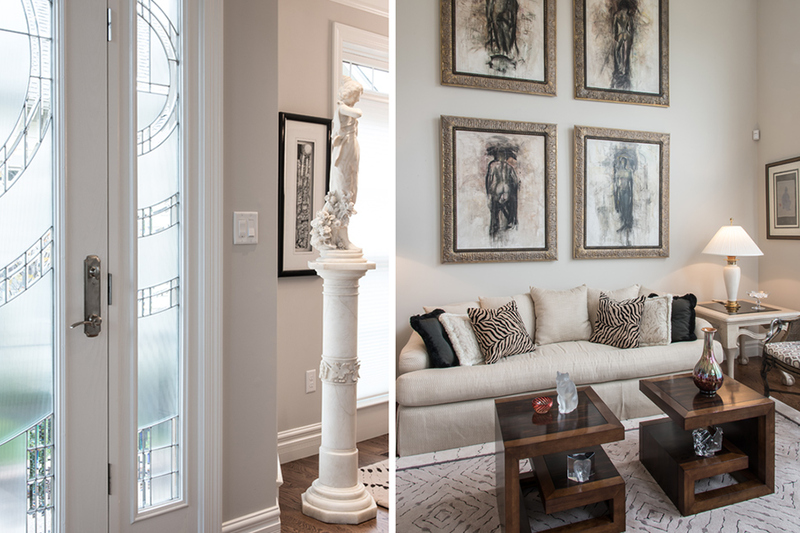 The great room’s display niches were custom designed for specific pieces, and abundant artwork adds color to this elegant gathering space. Above the mantel is a Richard Hall painting. On the opposing wall, the arch to the breakfast room is surrounded by another Hall painting and two Chagalls. Other noteworthy pieces include a Picasso, Lichtenstein’s “Cathedral,” Murano figurines and Steuben and Lalique birds. In a major structural change, Pepper reconfigured the breakfast room, moving the bay from the back of the villa to the side and providing access to a spacious rear deck that overlooks the lake. Open to the kitchen, the breakfast room combines a previously owned black absolute granite table with Century chairs, an area rug geometrically scalloped to emulate the table’s custom shape and a chandelier designed to match the pendant lights suspended over the kitchen island. 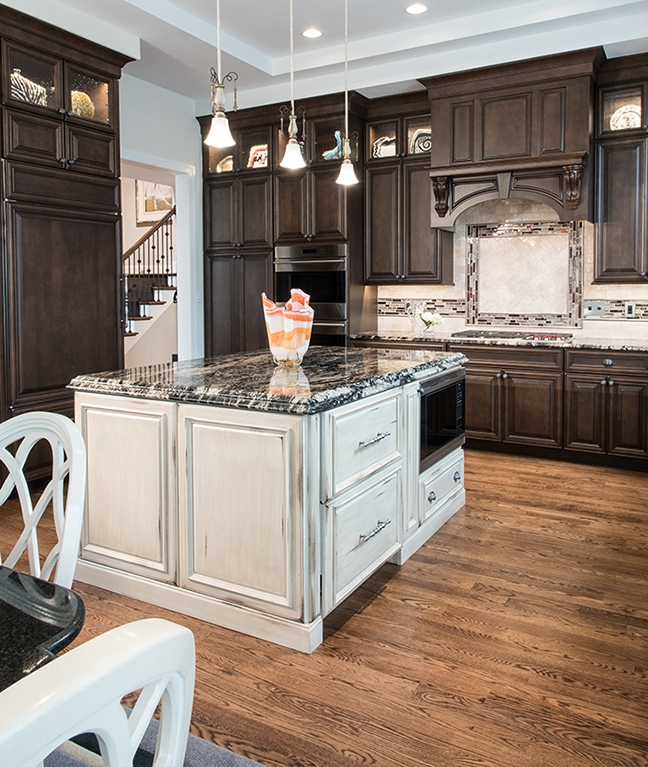 In the kitchen, the soffit was lowered, establishing a floor-to-ceiling effect for the rich, distressed-walnut Beck/Allen cabinetry and built-in Sub-Zero and Wolf appliances. Double ogee granite tops the hand-rubbed/scraped island with its English white finish, and Pepper created the bold wall-tile design, which ties the elements together. Virtually all of the luxurious furnishings in the master bedroom came from the owners’ former home, but Pepper transformed the suite into a spa-like retreat with a spectacular, custom-designed bath featuring a heated Carrera marble tile floor, zero-entry all-glass shower and floating-air tub. On the walkout lower level, Pepper chose a “mix of traditional and contemporary styles” for a relaxed, comfortable ambience in the vast entertainment area. Book-matched marble slabs encase the linear fireplace, which is flanked by lighted custom niches. Granite countertops and wicker/bamboo/leather bar chairs add glamour to the fully equipped wet bar. A traditional game table is juxtaposed with an intriguing cabinet by Richard Hall; plush seating is arranged around a Maitland-Smith coffee table; and of course, an array of fine art, including an original Trova, is displayed everywhere. New yet wonderfully familiar, this lovely villa residence has been thoroughly enjoyed by its owners for the past year, and their easy transition emphasizes two facts. In the hands of a skilled designer, “smaller” doesn’t have to mean “less.” And a harmonious designer/client/builder relationship is the key to gracious custom living.